Sell a Car to the Junkyard. Do Scrapyards Near You Pay the Most? Sell a Car to a Junkyard for Money - How Much Do Local Junkyards Pay for Cars? Looking to sell your car to a junkyard nearby? 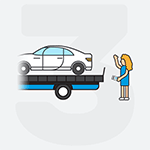 We tow your car for free from your home and pay you on the spot. Find out how much your car is worth now. Trying to sell your car to a junkyard can be frustrating. 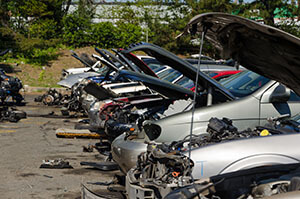 Finding a reputable local junkyard or a scrapyard near you is time-consuming, and ensuring you get the best price for your junk car is a headache inducing. Salvage yards will give you scrap car prices and haggle you down to your last dollar. Do junk yards buy cars? Yes, but they try to purchase cars for the lowest price possible. Rather than getting a low price when selling your car to a junkyard near you, you can sell your car online. You get free towing at your location, your home or your office, and you get paid on the spot. Selling your junk car is made easy, plus you get a fair market value for your vehicle. 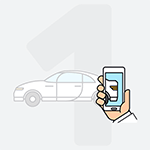 Get paid for your car in as little as 24 to 48 hours. Free Towing Nationwide. No FEES! We are A+ Car Buyer at BBB. Over 10 years in business. Instead of Selling a Car to a Junkyard, Try DamagedCars.com. Susie couldn’t have been more ecstatic when her parents gave her their old Honda Accord on her 18th birthday, but the years had passed, she was out of college, had been working as a customer service manager for an insurance company for nearly 3 years. And she was putting more money into keeping that car running than a car payment on a much newer and nicer car. It was time to sell the old car to a junkyard. An upgrade was needed, but she knew the car was on its last leg, so trying to sell it on Craig’s List would probably be more trouble than it was worth. She thought "Can I sell to a junkyard near me?". All of her friends loved that car. They had such great memories. So she posted a farewell picture of her car on Facebook and asked her friends if they had any advice. She admitted that she was a little nervous because she had never tried to sell a car to a junkyard before. Her friend, Steve, who lived one town over, said he had an old car sitting in the backyard of his parent’s house that they had been begging him to do something with, so if she wanted him to come over they could figure it out together. They had to figure out 'How much do junkyards pay for cars?' Her car didn't seem like usual junkyard cars. How to Sell a Car to a Junkyard who Pays Top Prices? We will hand you a check during the car pick-up. Suzie arrived at Steve’s a little past 9 a.m. on a Thursday. She had taken the day off from work, so she slept in for an extra hour. They talked about how great it would be to be rid of these old cars once and for all. Steve’s car hadn’t been running for about 9 months. The tires were getting lower each month and the birds had decided that Steve’s car was their new favorite target. He was hoping to get enough money for it to put toward a hiking trip in Costa Rica the next spring. Suzie would just be happy to see an end to the trips to the mechanic every couple months to find out that another expensive part had to be replaced, it would be better to just sell to a junk car buyer. She shared with Steve about how it is environmentally friendly to sell your car to a junkyard because it probably has some good, functioning parts in there that people would be able to give a new home in their own cars. This not only reduces environmental waste but also provides a parts aftermarket that allows people to keep their cars running without paying factory prices. Now they had to see 'how much would a junkyard pay for my car?' They Googled to find a local junkyard and then picked up the phone to call junkyards who buy cars. The first place they called, the phone rang and rang. It was almost 10 a.m., but no one seemed to be there. They finally got an answering machine, so Steve left a message. They didn’t really want to wait, so they found another place. Someone answered this time, but the person seemed a little annoyed when Steve started asking questions about how this works. They explained that since his car wasn’t running he would either need to pay them a fee to come to pick it up or load it on a flatbed and bring it over himself. The fee was high and Steve didn’t want to pay it, so they decided to take it themselves. He asked if they would pay him anything for the car and they said yes, but they couldn’t give him a quote over the phone. He’d have to bring it in. Sell My Car to a Junkyard Near Me, Does It Work? They loaded the car up on his friend's trailer and took it to the junkyard. The place was a mess and they had to dodge what looked like sheet metal and bolts and parts on the dirt road a few times to avoid puncturing a tire on his new Ford pickup. When they arrived, the sign said “Beware of dog. Honk for assistance”, so Steve honked and they waited not wanting to meet this dog. Someone finally came out after about 10 minutes, took a quick look at the car and then offered Steve $40. He knew that he should get more when he sells a junk car, but the offer was firm and they had driven all the way out there, so he accepted the offer. He couldn’t believe that was all they would give him. Suzie joked that at least they had some pizza money, but Steve wasn’t laughing. They returned to Steve’s where he discovered he had a flat tire. There went the pizza money. This wasn't what they imagined when they though to sell a car to a salvage yard. Disturbed and shaken by their experience, Susie realized there had to be a better way, so she did some research and found a website called DamagedCars.com. They said they could usually give a quote right online and she could decide if she wanted to sell or not. No pressure and No obligations. She liked that idea. She entered in her make and model and they asked her some questions about the car and her contact information. She then received a quote a short time later. She had checked the Kelly Blue Book Value on her car in fair condition and she knew that they would not be able to pay private party retail. With that in mind, they made her a very fair offer, considering they were picking it up for free and saving her the hassle of trying to sell it. She accepted the offer online. Check How Much is Your Car Worth! They then asked her to submit some verification of ownership so that she wouldn’t be hit with any surprises when they arrived. She was able to scan the title and her license with non-essential information marked out. After a quick verification, she scheduled a convenient appointment within just two days. It would feel so great to have this car off her hands and money in them so soon. On the day of the pick-up, a nice man called to verify she was there, and then a couple of pleasant and friendly men who worked a local DamagedCars.com service provider arrived on time to pick up her car. They handed her a check for the exact amount of her offer and she handed the men the title and keys. Then she went back inside to finish watching her favorite show. Using DamagedCars.com is that easy. We buy junk cars every day, so we know the what your junk car is worth. Get an instant offer and sell your car fast!